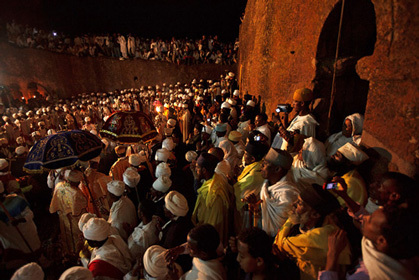 Those fortunate enough to be in Lalibela this coming January will enjoy a timeless Christmas celebration with at least 50,000 other pilgrims. Carved out of the red volcanic stone common in the area, the 11 monolithic churches of Lalibela are a symbol of Ethiopian resilience and ingenuity. Similarly, modern participants of Ethiopian Christmas often have to exercise more than a bit of ingenuity and resilience when in search of Ethiopian Christmas festivities outside of the country. 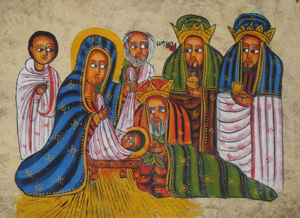 If you've never heard of Ethiopian Christmas until reading this article, be sure to check out some pages with great info on the origins and traditions surrounding the holiday. We've found some local groups and websites from all over the U.S and Canada. Some groups are small, others large and well established--but all are places where the spirit of one the world's oldest celebrations can be experienced in full. We've also found a list of Ethiopian markets and grocery stores that might have just the ornament, or ingredient, you need to make this year's celebration that much more authentic. With a diaspora as large as Ethiopia's, there's certain to be a pretty big population in larger cities such as New York, Toronto or Washington D.C, however it may not be as easy in smaller cities. If you can't find an Ethiopian church in your area, it might be time to turn to websites such as Meetup and Couchsurfing - both are great resources for networking and community involvement. Meetup alone has over 30 groups, all with numerous events each year. Couchsurfing is more commonly known for allowing travelers to arrange free sleeping arrangements in the homes and apartments of members all over the world. It is also home to a pretty vibrant forum and has more than a few Ethiopian groups. While websites such as Meetup are great, they're certainly not a complete source. Groups such as Chicago's Ethiopian Community Association and the Ethiopian Community in Minnesota, are just a few of the numerous community groups in North America. 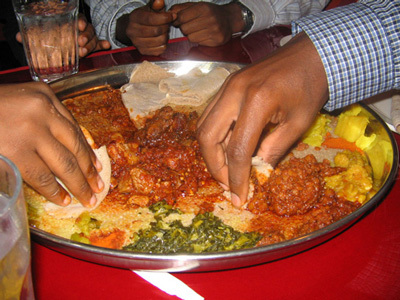 Beyond the community groups and events, there are several traditional Ethiopian stores to be found in major cities across the U.S and Canada, and luckily there is a website that has compiled a list! If you're in need of that 'one' ingredient for this year's Wat or just want to take a stroll down an Ethiopian market, be sure to visit Mesob Across America, where you can find a pretty thorough list of Ethiopian markets throughout the U.S.
Christmas comes twice a year for those who follow Ethiopian tradition, and we hope your holiday is a great one whether you're in Lalibela or Washington, D.C. Thank you for visiting the JoinVIP blog. Since 1996, VIP Communications has helped thousands of people just like you to connect with loved ones overseas and across international borders. Check back often for more helpful international calling tips, telecommunication developments and other useful information. For more information about VIP Communications, please call (800) 836-5004 (US & Canada), or contact us via secure message. Tell us how you will be celebrating Ethiopian Christmas this year.